Another week of adventure camp is over, with just one more week to go. I enjoy the walks, the kids and the camp, but week after week of hiking six times up and down the mountain in 90º heat and high humidity are two things I won’t miss. I also enjoy the trail we follow, though after hiking it a total of 42 times in 7 weeks, let’s just say I’m looking forward to seeing something else for a while. It certainly has been true that I see something different on each of my walks, even on the same trail. Yesterday, for example, we saw scads of tiger and black swallowtail butterflies, an assortment of toads and frogs, two female box turtles, a groundhog and two red-tailed hawks among the usual assortment of ferns and fungus. One of the turtles retreated to the safety of her “box” the instant we picked her up, but the second was actively “air swimming” throughout her brief encounter with 13 kids, to their delight. I’ve noticed several common themes with the kids I’ve led on these hikes. Their conversation tends to run to the video games they play and they don’t know even the most basic things about being in the woods. Despite my attempts to keep them quiet “so we will see more,” they really don’t get that at all. I’m sure it would be easier with fewer than 12 or 13 kids in a single group. And if there’s one hyper-active kid in a group, that infects the rest of them too. I’ve told more than one group that if they had to hunt to survive, they would all starve. More serious is the “can we pick it?” requests that I get, especially if I mention that a certain plant is rare. If it’s rare, they want to pick it. They have obviously never been told otherwise. I occasionally get similar requests when we find a turtle, a snake, a toad or a frog. “Can we keep it?” “Can I take it home?” And I have to gently tell them that this animal lives in the woods and its home is here and that we should leave it in its home. 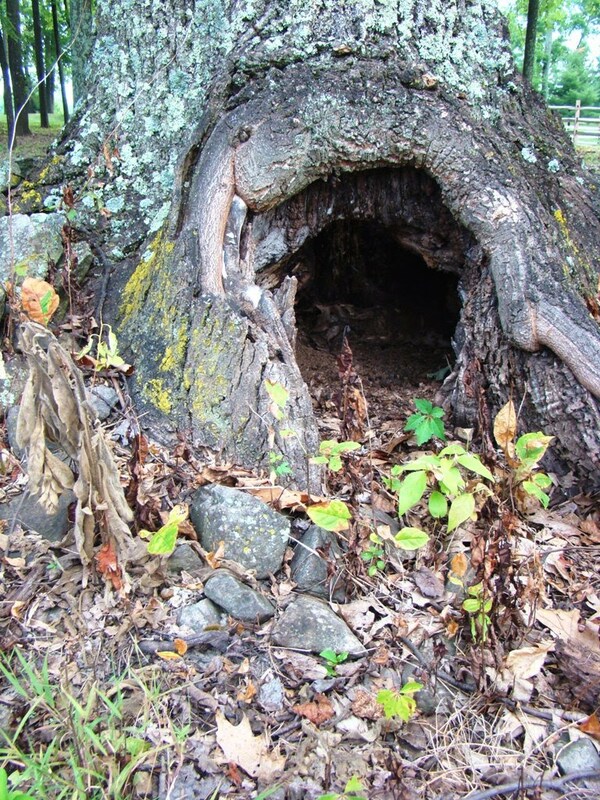 I tell them that in the woods we are the visitors and that we should act like guests in someone else’s home. I don’t think they get it, but I tell them anyway. It’s that time when the forest is barely light when I leave the cabin for my morning walk with Dog. By the time we return the sun is almost but not quite above the horizon. I love walking while the day slowly awakens and I can watch it happen. This time does not last long. Within another month I will need a headlamp to begin my morning walks and within two months, I will probably need the headlamp during the entire walk. But for a short while I get to see both the end of the night and beginning of the day, and these few weeks are one of my favorite times of the year. I start my walk under cover of night’s silence and end it with wood thrush and pewees singing their morning chorus. These past few, cooler days have made my morning walks enjoyable again, and I find I am noticing more than during the hottest days. Perhaps there is more to notice, as the animals and birds seemed nearly as debilitated by the heat as I was. Perhaps I just need a minimum level of physical comfort to be able to notice what is always there. Whatever the reason, my morning walks are a blessing that last the whole day. I think it's time for a little gratuitous beauty today. 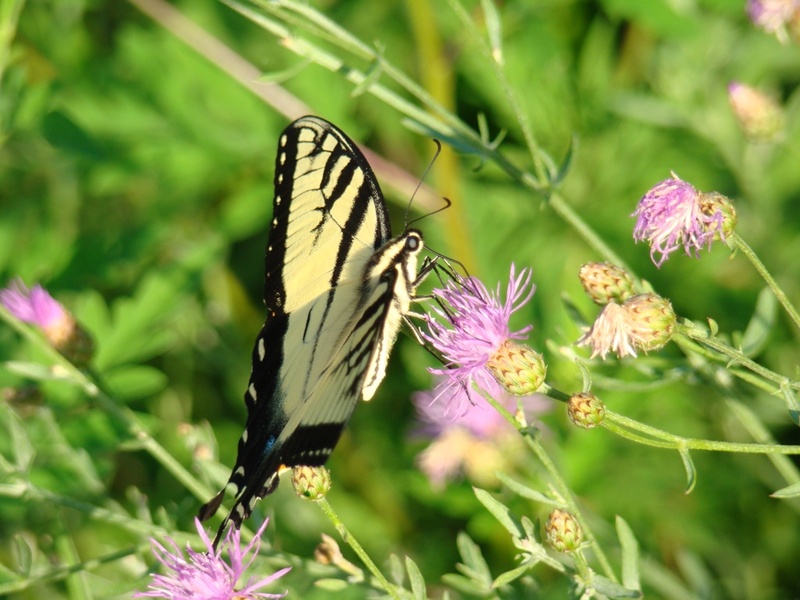 This year on Roundtop is a great one for the large swallowtail butterflies. 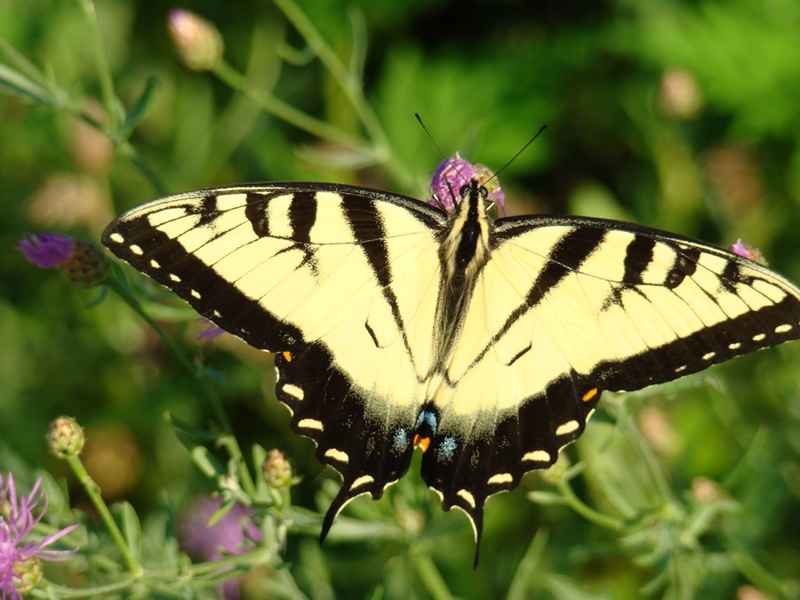 I've seen Tiger Swallowtail, like this one, all over the place. Pipevine Swallowtails are also not in short supply. The smaller or medium-sized butterflies I am not so sure about. Perhaps it's just not their year. 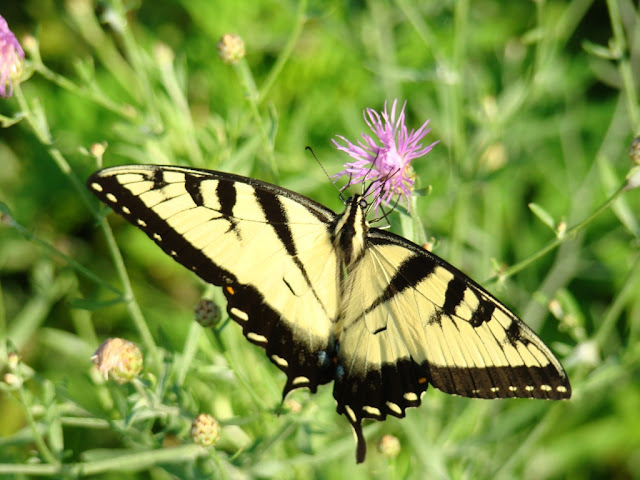 Perhaps the large swallowtails like the extreme heat on the east coast this year. This morning I heard that this July is already the third hottest since record-keeping began in the Harrisburg area. Suddenly, I don't feel like such a wimp for thinking about buying an air conditioner. This July is also close enough to the #2 slot for the hottest-ever July that there's a chance 2010 will end up there. With heat like this July has given us, a little gratuitous beauty is much needed. Enjoy! Ahhhh! The heat and humidity are gone, if only for the next day or so. Still, after 98 degrees on Saturday, I will certainly take whatever relief I can get. For me, summer is simply what I have to put up with to get to fall hawk migration, so attending a get-together with other hawk people in midsummer really gets me ready for the new season. I was at Hawk Mountain on Saturday for the annual Kittatinny Roundtable, where hawk counters from the region get together to look at last season’s results, hear a few hawk-related presentations and just have fun. And anything that gets my mind off 98 degree temperatures is welcome. 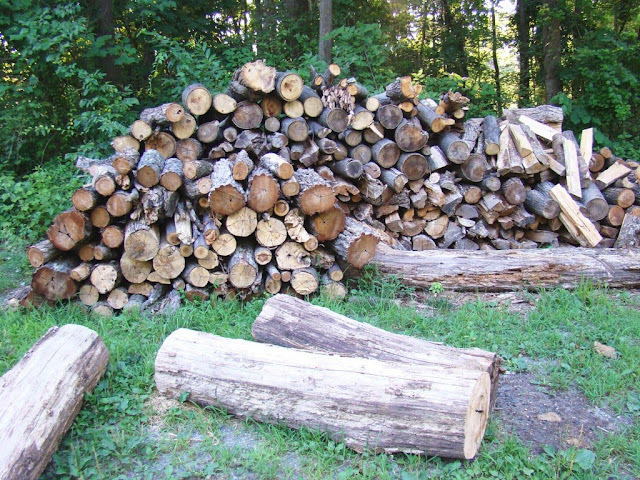 So with the sweltering heat outside, I spent more time inside than I did wandering around the forests of Roundtop Mtn. On Sunday the weather turned nasty. Driving home I saw a wall cloud with a vague amount of rotation. Or perhaps a cloud that was trying to rotate is a better way of putting that. It never did amount to much, but is indicative of what was happening as a storm front came through, and the tornado warning wasn’t far behind. Fortunately, the rotating part of the storm never got its act together and other than turning the sky midnight black and bringing some rain to my cabin door that was that. Afterwards and this morning, the humidity is gone and the weather much cooler. Suddenly I have lots of energy and ambition, and I’m ready to tackle projects around the cabin again—at least until the weather heats up again. My photo this morning is an evening primrose. Around the mountain, I have seen several plants over the past two weeks or so, and I have been anxiously awaiting their blooming. In some places the flower blooms in June but here I think of them as a midsummer and late summer bloom. It’s that lovely shade of yellow I find so enjoyable. The flower looks summer sunshine on a stalk. Why can't I have a canoe,too? Roundtop installed a dock for the canoes at Adventure camp this season. 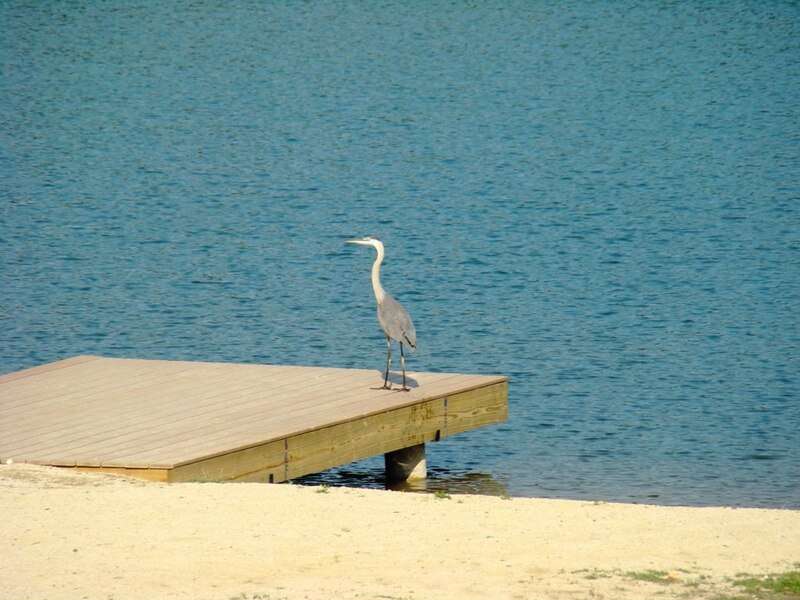 It wasn’t in a day before Mr. Great Blue Heron was trying it out. Or maybe just waiting for the next canoe. 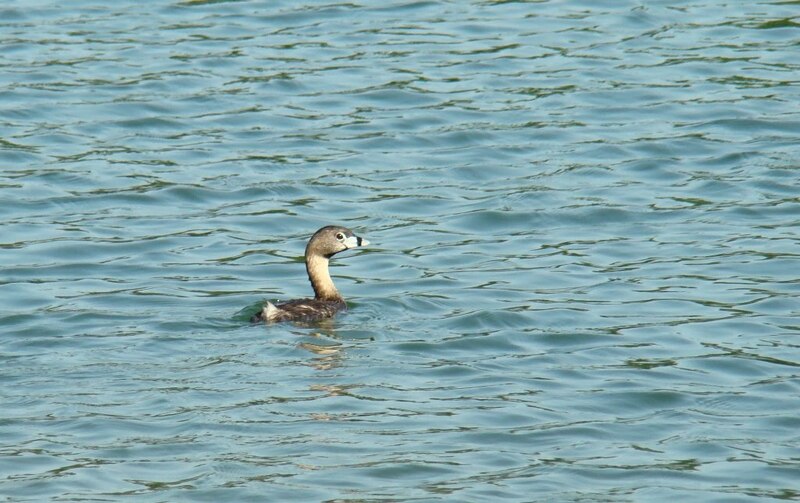 The pied-billed grebe that I first saw here last week is still there. All the groups got to see and catch assorted frogs and toads. Blackberries were eaten (no, not that kind. The real kind). Puffballs were poked. Squirrels were stampeded. One group saw a very small garter snake. It might even have been the same one found the first week of camp. One group saw a male and female scarlet tanager. I was more excited about that than they were. Another group got to see an immature red-tailed hawk at close range. It wasn’t happy about something, and for once it wasn’t an invasion by 12 noisy and bouncing kids that had it upset. A Cooper’s hawk was nearby. Brown-eyed susans are profuse around the mountain right now, a shock of golden against the forest’s sea of green. It’s always the different thing that stands out, isn’t it? I find it easy to ignore that ocean of greenery, but my eye is caught by any shade of non-green. Intellectually, I sometimes think I should spend more time noticing the details of the greenery, but I find that hard to do. I just can’t get excited by a leaf that looks the same as its neighbor. But if that leaf is red or yellow or blue…it’s a different story. 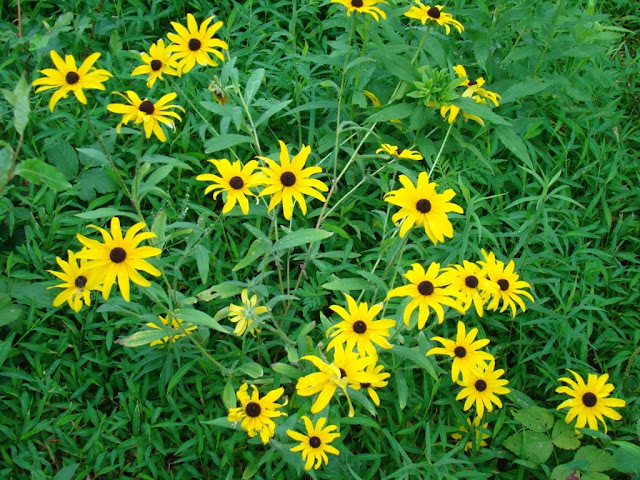 I find Brown-eyed susans especially easy to like. They usually bloom in clumps, so it’s not just a single flower or two. They are large, almost gaudy and the color is quite a contrast to the green leaves surrounding them. They are attractive to butterflies, too, making these wild patches a good place to scope out different species of them. This seems to be the week for surprises on Roundtop Mtn. The butterfly in today’s photo is, I believe, what is euphemistically referred to as a red-spotted admiral. 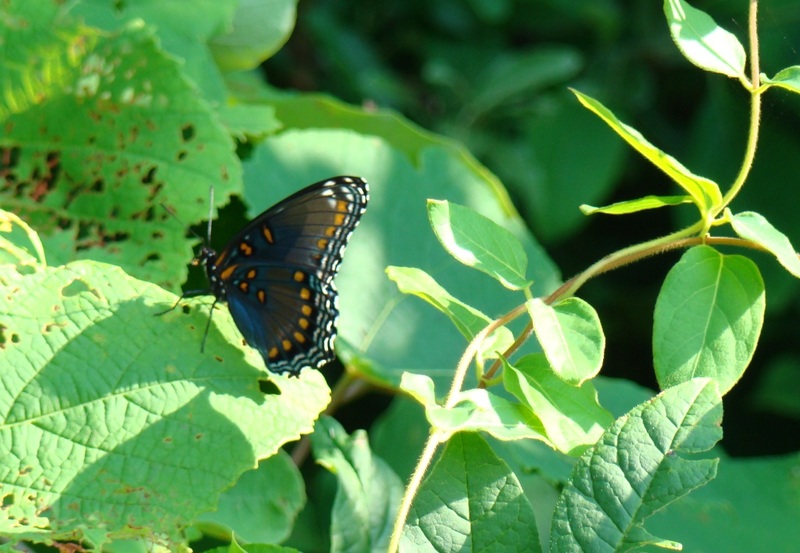 A red-spotted admiral isn’t a true species, it’s a hybrid between a red-spotted purple butterfly and a white admiral. I happen to live in a fairly wide geographic band where the two interbreed. Hybridization isn’t the only interesting feature of this butterfly. It’s also a mimic. Several swallowtail species and the red-spotted purple butterfly are among at least 6 species identified so far as those that mimic the appearance of the pipevine swallowtail. 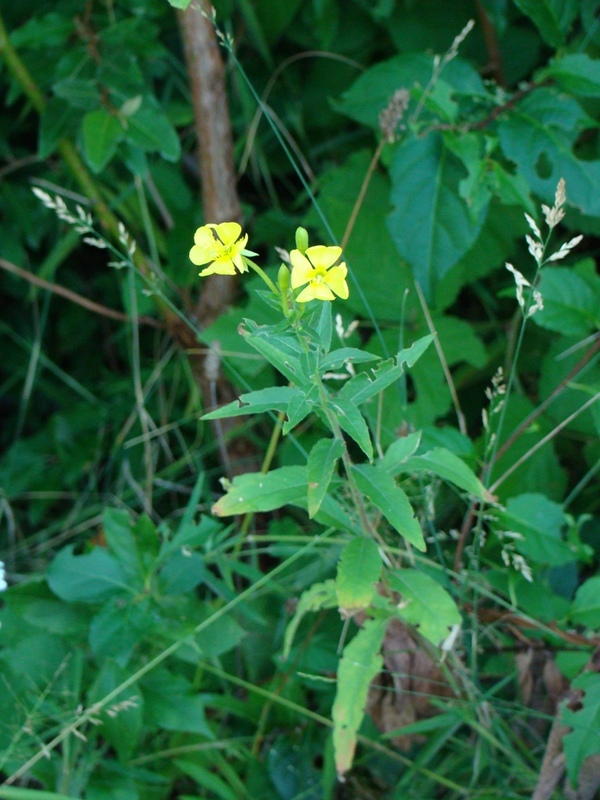 Pipevines are poisonous butterflies. The red-spotted purple is not. But by mimicking the appearance of the poisonous butterfly, the purple hopes predators will think it is poisonous, too. For me, this is simply a beautiful butterfly that was calm enough to sit still long enough for me to snap a photo. I enjoy finding out about the things I see on the mountain, but really, I’d think I’d enjoy its beauty just as much even if I didn’t know all that about it. So just what is a pied-billed grebe doing in southern Pennsylvania in the middle of July? I wish I had a good answer for this one but I don’t. On Sunday morning I returned to the pond by adventure camp to see if this little bird was still around. It was, as you can see from today’s photo. It was still swimming and diving in seeming happiness, though it eyed me warily and didn’t allow me to approach as closely as noisy kids flailing canoe paddles were able to on Thursday. As I’ve never before seen a pied-billed grebe here anytime other than surrounding the colder months, I decided to investigate the sighting. As it turns out, mid-July is just about the week with the least number of sightings in the state, though sightings are not unheard of. My two sightings on Thursday and Sunday are the only records (in Cornell’s E-Bird) in York County in the last 30 days. I found two other records from late June in PA and both of those were fairly nearby. 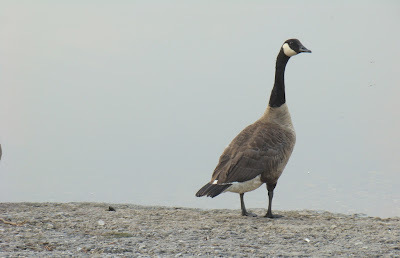 One was in Hershey, about 25 miles away as grebes fly, the second perhaps 50-60 miles further east. 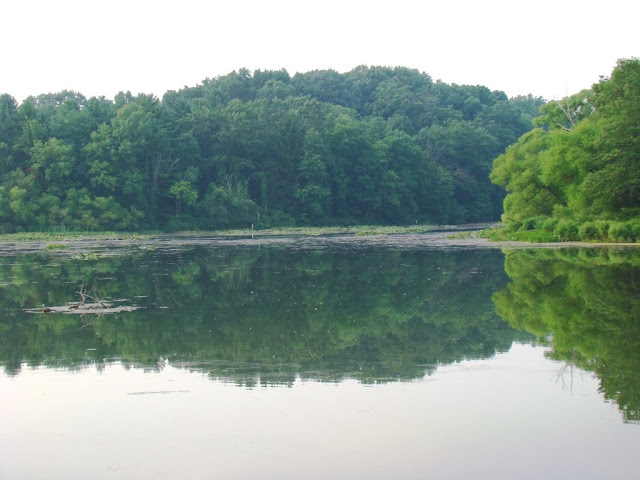 Another sighting was reported along the Delaware River near Trenton. That’s it. The bird itself isn’t rare, it’s only rare to see one in summer while I’m wearing flip-flops and shorts, instead of boots and fleece. The adventure pond at Roundtop is also not where I would have expected to see this bird. 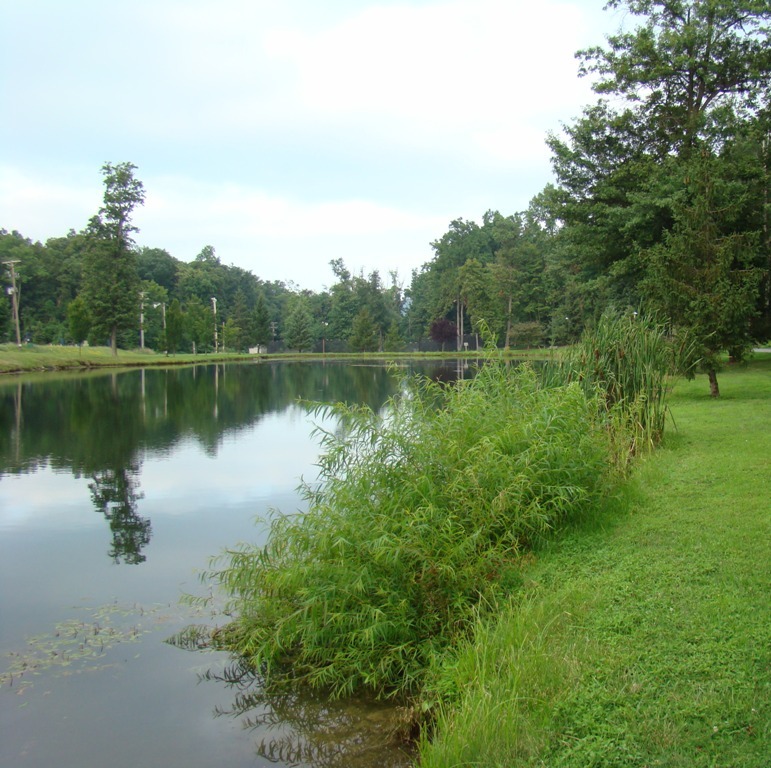 The pond is surrounded by forest, which is good, but there’s no aquatic vegetation along the shoreline, which is what these birds usually like. They need a lot of space to take off, running along the water to gain speed. There is that here. Still, if I had been asked to guess where I might find this bird in summer, this pond would not have been on my list. 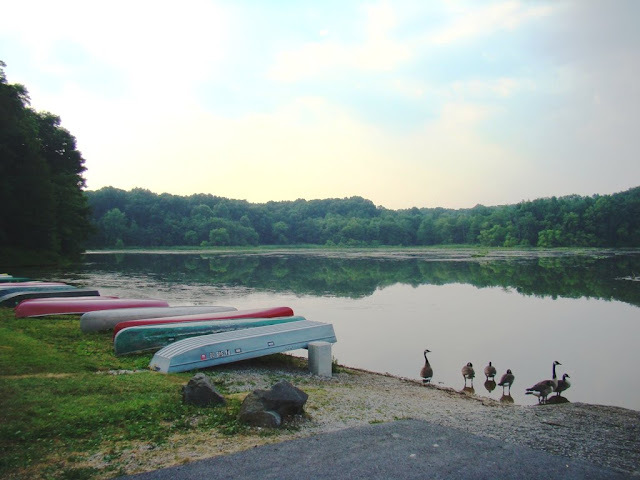 I would have guessed the big lake at Pinchot State Park, just a few miles away. But instead here it is. Why this bird chose this location and why it is here now is a mystery that will remain unsolved. Yesterday was my day leading kids around at adventure camp. Boy, was it hot! The temperature was 92 and the humidity was terrible. I drank oceans of water over the 6 hours of hiking. When I got home I was as soaked with moisture as if I’d stood out in a rainstorm. This morning I am still tired. Of course, Baby Dog woke me up a time or two to complain about the nightly raccoon, so sleep deprivation is at least part of that. I make 6 trips up and down the mountain with a different group of kids each time. Typically, I start to hear one or two of them asking “how much further?” after about 30 minutes into the 60 minute hike. Even the kids who claim to spend time running aren’t used to walking for more than a few minutes at a time. A 60 minute walk is really foreign to them. Yesterday, despite the heat we (or at least I) had a good sighting. A pied-billed grebe spent the day tooling around the pond, even while the kids were paddling their canoes all over it. The bird seemed healthy and happy—the pond is full of frogs—and wasn’t at all disturbed as the kids paddled very near it, shouting and flailing their paddles around. Once or twice I saw the bird move to the opposite end of the pond but it was soon back amongst the kids. In the heat, we didn’t see a lot of animals, though we did manage one deer. As the kids typically make a lot of noise, that was unexpected. Butterflies, especially swallowtails of several species, were out in force. And the rain on Wednesday brought lots of frogs and toads for the kids to catch, which made up for having to walk 60 minutes at one time. At least I think it did. 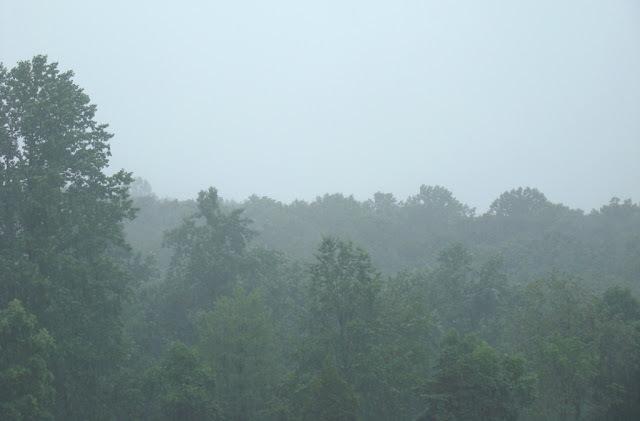 The forest is gulping down the rain that’s falling here on the mountain, though it’s too soon to see brown and wilted vegetation turn green again. Maybe by evening. The rain is much welcomed and a relief. The rain puts an end both to the immediate fire danger and to the niggling worry that never quite disappears over the threat of dry wells. 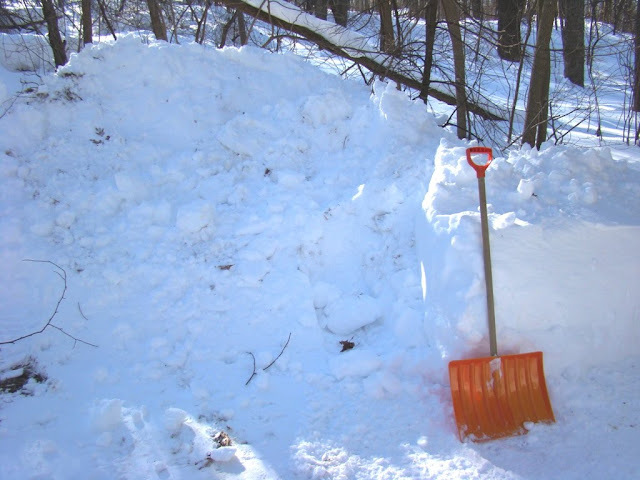 From my vantage point, I’m never too far from seeing how much weather can impact daily life—not just my own but also that of people who live in nearby metropolitan areas. The difference is that I see right away when fire or drought is endangering the area, and I think many people who live in urban areas don’t. Their houses are still there, the streets are still there, the watered lawn is still there—it’s easy to ignore outside conditions when you don’t see much that’s outside or natural. I can’t help but feel this isn’t a good thing. I’m toying with all sorts of weird ideas. Maybe we should have automatic shower shut-offs timed to the level of the local water table. On a normal day you can have 10 minutes. When the water level is low, you get three. Or what about the electricity police who would enforce a ban on electric candles in every window of the house? Do we really need 10,000 Christmas lights on every house? Do you think any of these might work? It’s been kind of a quiet day. I wonder if I’m missing something. Oh, there was the oddly torrential rainstorm that lasted but a few minutes, but that’s the kind of thing that’s more or less normal here on the mountain. Perhaps it was the rain and the threat of more, but for the first time in a while, I slept through the night without being awakened by Baby Dog seeing a raccoon or hearing the fox bark. Dog and I didn’t see any deer or rabbits on our morning walk either. The most exciting thing that has happened is that I was eyed suspicously by this Canada goose. I’m torn between hoping the rest of the day is as quiet and hoping that it becomes just a tad more exciting—nothing too major, please, though. A lovely moth, a visit by an uncommon summer bird, a new summer flower—that’s all I’d like to have cross my doorstep. 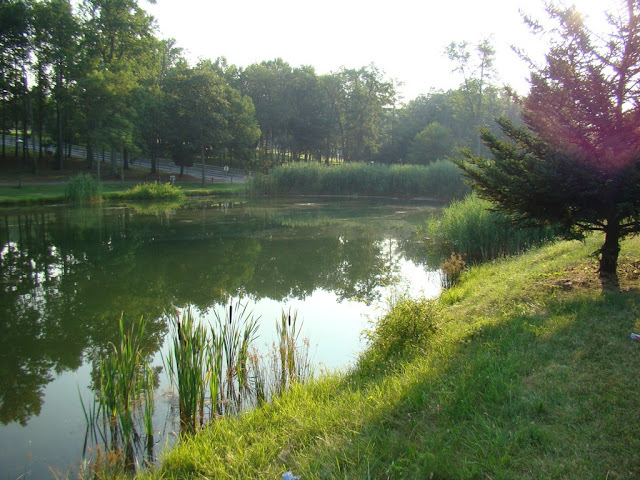 The loveliness of a cool summer morning seems extraordinary after last week’s heat wave. Sitting out on the deck, a mug of coffee in one hand and a newspaper in the other are pleasures I had to forego for a while. Now that those are reestablished, all seems right in my little corner of the forest. That’s assuming, of course, that I don’t read the newspaper too closely. Allow me a day or two of enjoying my little routine before I fall back into the abyss of reality. 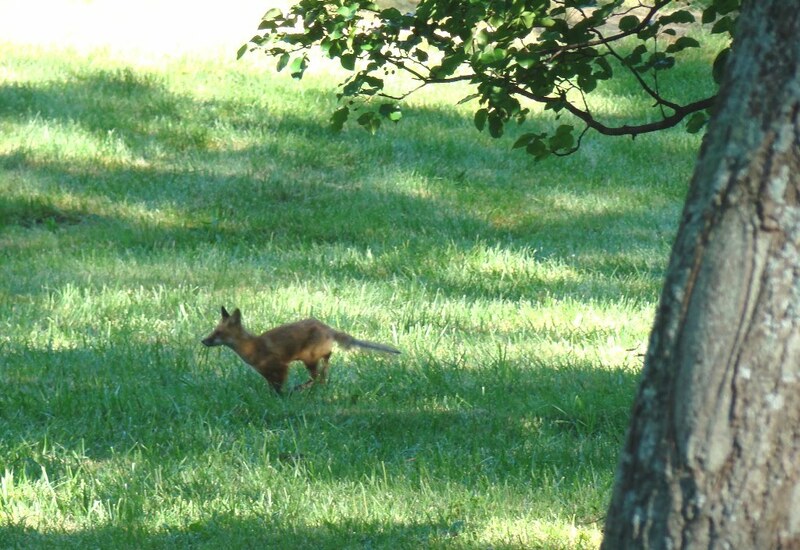 The improved weather and cooler temperatures mean I am suddenly seeing more animals around the cabin again. Early Sunday morning as I was heading off the mountain, I saw this large and lovely red fox sitting alertly next to a moist ditch—I would be overstating the case if I called it a stream. The fox was likely looking for mice or other delectables in the tall grass. When another car went by on the nearby road, she loped off and I managed to get one not-too-blurry photo. It was only when I looked closely at the photo that I saw the fox had almost no hair on her tail. It might be from mange or it might be from fleas. She certainly looked otherwise healthy and was acting fine, so I hope it’s nothing serious. The fox aren a near-constant presence after dark around the cabin. I hear them barking several times a week. Last night I heard the first bark a little after 10 p.m. and then again an hour or so before dawn. Their calls always set my dogs to barking, which naturally wakes me from a sound sleep. The dogs require that I go to the door and assure that we are not being attacked before they stop barking. They immediately fall back to sleep. Me? Well, sometimes. Between the fox and the raccoons, it’s rare for me to be able to sleep through the entire night. That’s at least partly why I need coffee on the deck before I can properly start a day. The heat wave hasn’t quite broken just yet, though it has moderated enough to feel some relief from the worst of it. The humidity is worse than soupy—you could cut it with a knife. This morning around 3 a.m. I was awakened by the sound of a rain shower and had to get up to close a few windows. The shower didn’t amount to much, but I could feel the temperature had lowered to a point that was comfortable. Comfort is a relative term. Once the temperature drops back to normal levels, last night’s comfort may feel sweltering, but last night it was just fine. If there was ever a week that I am glad that camp was closed for the holiday week, it was this one. Of course, the summer is still pretty young so I may yet get slammed with some awful heat, but I’ll worry about that when it happens. You know, I think I really do feel cooler when I look at this photo. Today the temperature is to drop out of the triple digits and move into the mid-90’s. I am ready for that. This morning the cabin was 2 degrees cooler than it was the day before, and outside I can feel just the barest hint of a breeze. The breeze is nothing to crow about, but after the dead stillness of previous days, even a hint seems worthy of mention. I took the first photo in late February, after the second 2-ft snowstorm blanketed the mountain. Quite a difference from today’s weather. 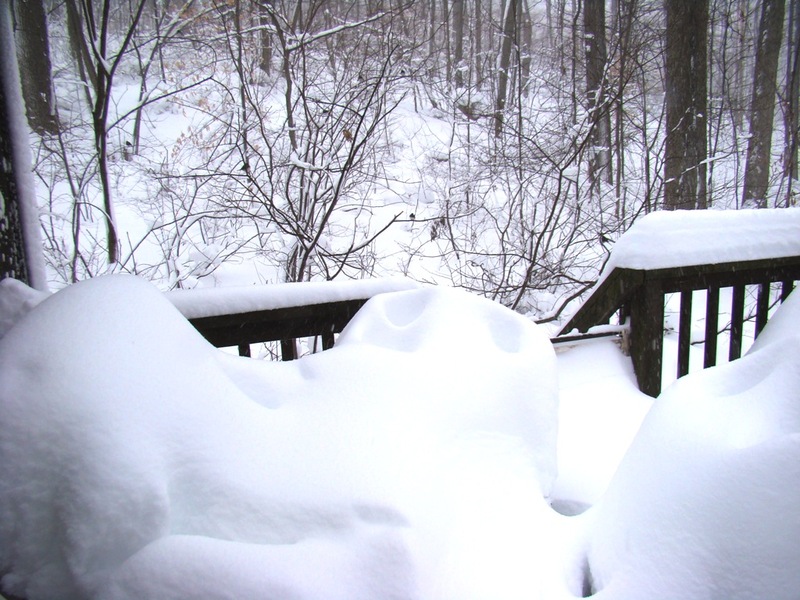 The second photo is of the mystery objects on my back deck. 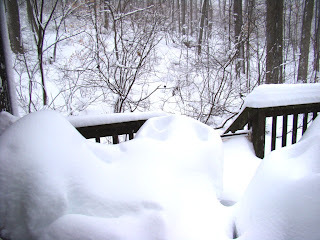 The mystery is now solved and the deck furniture is visible once again. When it is as hot as this, 2 degrees cooler is a distinct, if slight, improvement. On more moderate days, a temperature change of 2 degrees isn’t noticed at all, though if you were thinking about it, you just might be able to notice. But at these higher temperatures, those 2 degrees are both noticeable and welcome. It’s not enough for me to start cooking again or to tackle the pile of ironing, but I’ll take it. 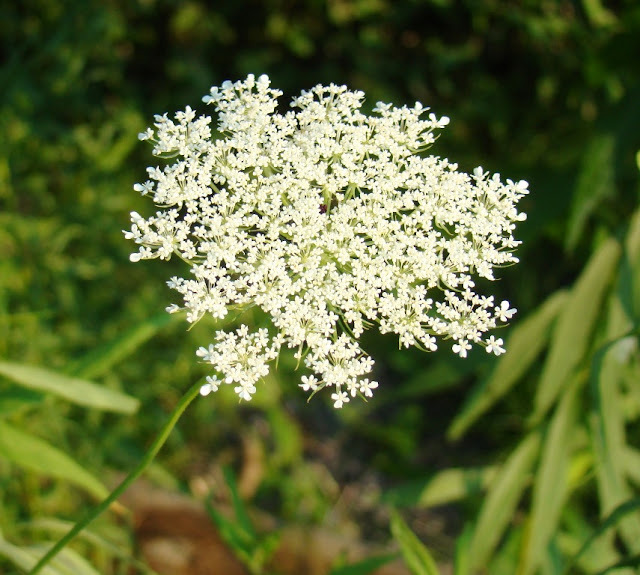 The summer heat wave continues, and about the only thing that isn’t wilting in this 100F heat are the Queen Anne’s lace blooms, summer’s snowflakes. The heat is just sucking the moisture out of the ground, making a mockery of the too-much rain we had until just a few weeks ago. Here in early July, the forest is as wilted and brown as a bad August. Last night a local raccoon raided the chickens’ water bottle, updumping it in an effort to get a taste. I keep the water just outside their pen, because they updump it when it’s inside. The raccoon didn’t bother the chickens, only the water. I guess that gives you an idea of how dry everything suddenly is. The dogs look like deflated balloons, stretched out across the cabin floor. The cats are no better, and neither, I suspect, am I. Still, as much as I dislike this weather, I do find a few upsides to how I put up with it. At work yesterday, the air conditioning went out for a bit, and you’d have thought the world was ending. Even before the office reached 80 degrees, people were wilting and claiming the conditions were unbearable. That’s when it occurred to me that people who spend their whole lives in controlled climates feel uncomfortable when the temperature varies just a few degrees beyond that controlled level. Someone like me, who lives in an uncontrolled climate, is better able to adapt to wider swings of temperatures and still feel comfortable. Of course, I may find this ability disappears by the time I am elderly. I will worry about that then. For now, let’s just say that an 80-degree office still felt pretty good to me. I do worry, a bit, if controlling things like a household temperature to within a few degrees all year long is really doing the human species much good. Less than 100 years ago, no one had air conditioning and people survived. Amazing, isn’t it, that today people will complain when the temperature reaches 80? I’m in the middle of a heat wave and I’m not liking it very much. The temperature is always cooler in the summer at the cabin than it is away from the mountain. It’s usually about 5-7 degrees cooler than the suburbs and usually 3-5 degrees cooler than the rural land surrounding the mountain. But when it’s 100 degrees in the city, that still translates to pretty darn hot at the cabin. This area doesn’t see many 100 degree days, fortunately, and in most summers I do pretty well without an air conditioner. Most summers I think I need air conditioning for about 3-4 days, and then I reason that it’s a lot of money to spend to keep myself comfortable for 3-4 days of the year. The last time it was this hot I was in high school, marching in the band in a 4th of July parade in York, Pennsylvania. I remember we passed underneath one of those bank time and temperature signs, and the temperature read 106 degrees. It hasn’t been that hot yet, fortunately, but it could get close in the next day or so. Over the long holiday weekend, I lived like one of the forest animals—napping during the afternoons and then coming out again in the early evening. Dog and I took our walks just after dawn or just before dark. We scared up a young red fox getting water down at the pond that way. Dog was ready to give chase but the fox was already long gone. Right now, it’s hard to believe that the first of the fall hawkwatches will open for counting in less than a month. It can’t come too soon for me. Cooler weather can’t come too soon, either. Regular readers of Roundtop Ruminations might remember that my summer Thursdays are spent leading kids on walks in the woods. I want them to have fun and see some interesting things and get to experience the woods in a hands-on approach. Yesterday was a good session. The kids tasted sassafras, found a few ripe blackberries and raspberries, caught frogs and toads, found deer and raccoon tracks and startled a close chipmunk. We looked at Indian pipe fungus, puffballs and ferns. I showed them how to find an American beech tree or shagbark hickory by the distinctive bark on those trees. Our best sighting was of a Clymene moth, which I’d never seen before. 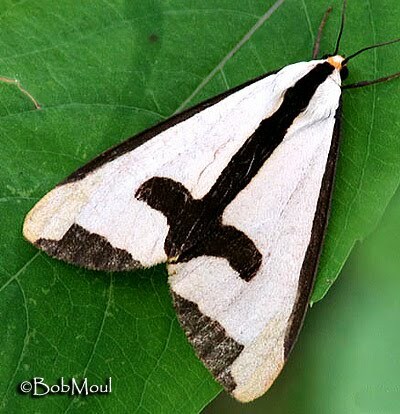 The kids saw it upside-down from this photo that I pulled off the butterflies and moth site and thought the markings on the back looked like a picture of an angel or a cross or maybe Jesus. The moth was previously recorded in York County, but Pennsylvania sightings are not recorded very often. That may be more a function of the number of people who pay attention to moths—not very many—than the moth itself. The word Clymene is the name of several Greek goddesses in mythology. One is the goddess of fame and infamy. Another is a woodland nymph who is the wife of Helios the sun god. This last makes some sense as the moth is said to be often found in woodlands on hot summer days but will also come to lights at night. It prefers deciduous forests and is found during June through August. The range maps show it to be most common in Missouri and Kentucky, with sightings ranging as far as eastern Texas and up into Massachusetts and southern Vermont. I certainly wish I’d had my camera with me when we found it, but I don’t carry my camera when I hike with the kids. I want to focus on them, not on taking photos!